If you want your carnitas right away, there is no better method than the pressure cooker. 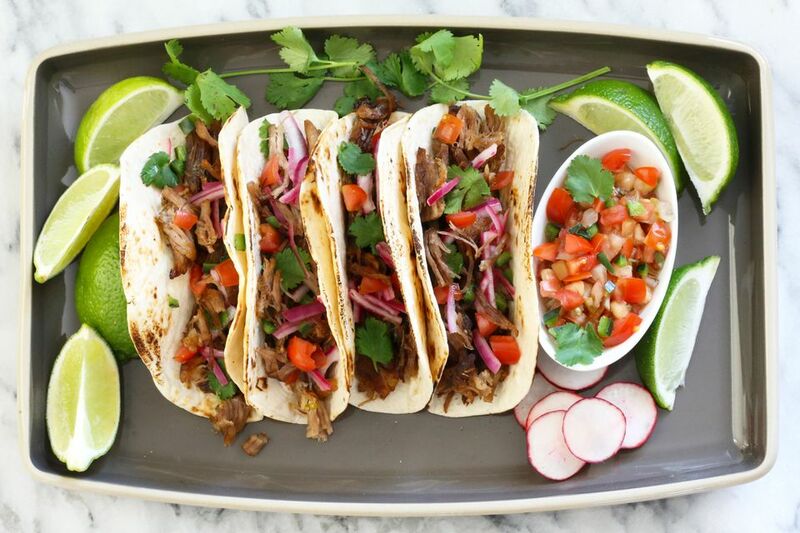 This Instant Pot carnitas recipe takes very little prep time, and only about 50 minutes of cooking time. Lime-infused pickled onions make a tasty topping, take just a few minutes to prepare, and can be made a day in advance. Use the suggested garnishes or add your family's favorite toppings. Sour cream, avocado slices or guacamole, cheese, and salsa verde are some other excellent choices. Peel the red onion and slice off the ends. Cut the onion in half lengthwise and slice each half thinly. In a small bowl or jar, combine the sliced onion with 1/3 cup of lime juice, 3/4 teaspoon of kosher salt, and 1/2 teaspoon of black pepper. If desired, add 1 teaspoon of finely chopped cilantro. Set aside. Pat the pork shoulder dry with paper towels, and cut it into large chunks. Choose the high sauté setting on the Instant Pot and add 2 tablespoons of olive oil. Working in batches, brown the pork in the hot oil (about 8 minutes total). Cancel the sauté function, and put all the browned pork in the pot. Add the oregano, cumin, and 2 teaspoons of kosher salt. Toss with the pork, then add the jalapeño rings, quartered onion, and bay leaves. Cut the 2 oranges and 2 limes in half and juice them; add the juice to the pot along with the chicken stock. Lock the lid in place, and make sure the steam release valve is in the sealing position. Select manual (or pressure cook button), high pressure, and set the time to 40 minutes. When the time is up, let the pressure release naturally (this will take about 20 to 30 minutes). Line a large baking sheet with foil. Preheat the broiler. Remove the pork pieces to a cutting board using a slotted spoon. Shred or chop the pork, and arrange the pieces in a single layer on the foil-lined baking sheet. Broil the pork for about 2 to 3 minutes, or until the edges are crisp. Arrange the pork in tortillas and garnish with the pickled onion, cilantro, salsa or diced tomato, and radishes, if desired. There are a few ways to get a nice char on tortillas. If you have a gas stove, place a tortilla over the lowest flame. Move it frequently until the tortilla is warmed and there are some char marks, then flip it over and repeat on the other side. You can also char it directly using a kitchen torch, or place in a dry cast-iron skillet over medium-high heat. Cook the tortillas, flipping to warm and toast both sides. To simply soften and moisten the tortillas, sprinkle a clean dish towel or paper towels with water; wrap the tortillas in the towels and microwave them for 30 seconds. Searing the pork pieces enhances the flavor, but feel free to skip that step if you are short on time.